What are some of the biggest problems our watershed faces? Old coal mine tunnels don’t go away. Instead, they fill with water where acid, iron, sulfur, and aluminum compounds are formed. Drainage poisons the ground & surface waters. Orange streams and ecological damage are not the only consequences. Water from wells or municipal sources must have these toxins removed prior to human use. In natural settings, rainwater and snowmelt percolate down through the soil and recharge the groundwater supply. Pavement, roofs, and other impervious surfaces prevent normal infiltration. The goal of quickly getting this water off roads and parking lots and away from buildings actually promotes stream flooding with all of its social, economic, and ecological consequences. Preventing stormwater from recharging the water table lowers the amount available during times of drought. Success treating “point source” pollution (from one specific point such as an industrial pipe), has shown that major contributors to water quality problems are large areas of land with no single discharge, “non-point source” pollution. Pesticides, fertilizers, and bacteria are washed from agricultural land. Petroleum products and salts are washed from pavement. Contaminants cause economic and ecological damage. Like AMD, there is an expense for their removal so the water is safe to use. Often the result of excessive stormwater runoff, soil and sediment erosion reduces the amount of topsoil (another valuable resource) available for food production and landscaping. Suspended in streams, these particles act like sandpaper, abrading living tissues and scouring stream channels and banks. Sediments fall to the bottom of the streambed, smothering all life and reducing the volume of water a stream can carry. The likelihood of flooding increases. How are we going to fix all this? 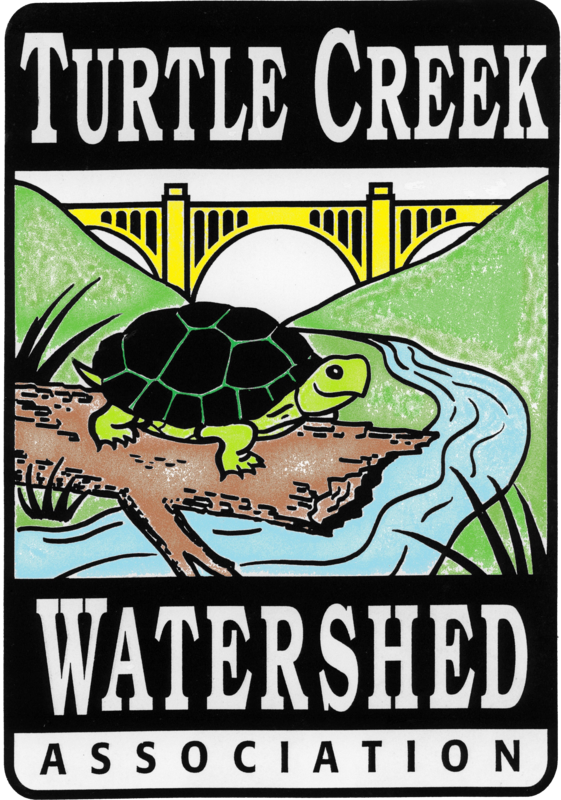 Turtle Creed Watershed River Conservation Plan- This provides an action plan to help guide TCWA and partnering organizations with projects within the watershed. Westmoreland County Industrial Development Corporation at Mellon Road- Completed in 2014, where storm water ponds have been retrofitted to improve stormwater management. Export Flood Control Project- Completed to control flooding during large rain events. Murrysville Community Park- Installment of pervious concrete and rain gardens to manage storm water. Turtle Creek Gorge and Trail- Development of the WHT along the 9-mile Turtle Creek Railroad Corridor to connect two National Recreation Trails to increase tourism and watershed recognition. Turtle Creek streambank stabilization project- Proposed Growing Greener Grant to stabilize 2.2 mile length of rail/trial corridor. Remediation of the Irwin Discharge Through Passive Treatment and Resource Recovery- One of the “worst” impacts to water quality in the watershed- Ongoing.